You have been forwarded here by another Internet site in order to register to the Single Sign On(?) Service of LOOK4. Once you have registered you will be reverted to the site https://www.look4optics.de:443/RedirectFromAuthenticationService.ashx?companyIDTemp=8921&redirect=https%3a%2f%2fwww.look4optics.de%2fShop%2fLieferantenHinzufuegen.aspx%3fcompanyIDTemp%3d8921. If you are not registered by now you can do that free of charge with the registration form. This will only take a few minutes. Welcome to LOOK4 ID, the Single Sign On Service of the LOOK4 Company GmbH. This service enables to you to authenticate yourself with a login (user name / password) for multiple connected applications at variable optics enterprises and to use this free of charge with a unique registration at the LOOK4 ID Service. With a link "Login" on the Web site of a connected online application (portal / shop / Web service) you will be passed on to the LOOK4 ID Service page. Therefore you have the possibility to authenticate yourself uniquely and centrally for variable applications. Your benefit is that you have to memorize only one login and the search for passwords omits. Do not respond to inquiries, which prompts you to enter your LOOK4 ID user data. Phishing is aimed to access your user data by pretending that it is our service or that our service is used. Should you have become victim of a phishing attempt, please notify us by e-mail or by phone. Contact details are located in the Imprint. Your portal, shop / your web application isn't connected by now? Offer your users more freedom and comfort when registrating to your Web site or your Web service. Today an Internet user needs different login data for the registration at each manufacturer. 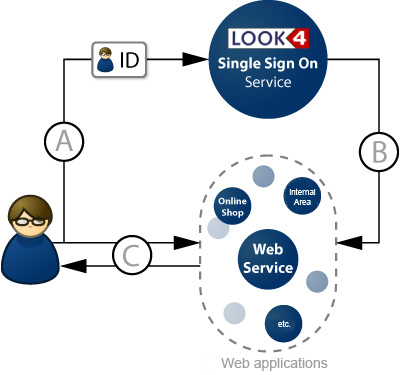 By means of LOOK4 ID, the Single Sign On Service of LOOK4, your customers are able to authenticate themselves in the future at your Web site and a row of other manufacturers with a unique registration. A classic process for a user would be that he visits his desired web application. Because he is not yet logged in, he is redirected the LOOK4 ID page, where he logs on with his LOOK4 ID (A). After a successful registration, the Single Sign On Service notifies the connected web application that you are a registered member (B). Now, all connected web applications know, that you are allowed to use them (C). Interested? - Register now for free!